Candidates for Macedon Mary-Anne Thomas (Labor) and Neil Barker (The Greens) were presented our community survey results at Hepburn Wind. Friends of the Earth have launched a Macedon Energy Futures Survey on the views voters in the hotly-contested seat of Macedon hold on the government’s anti-wind farm laws just weeks from the November 29 state election. 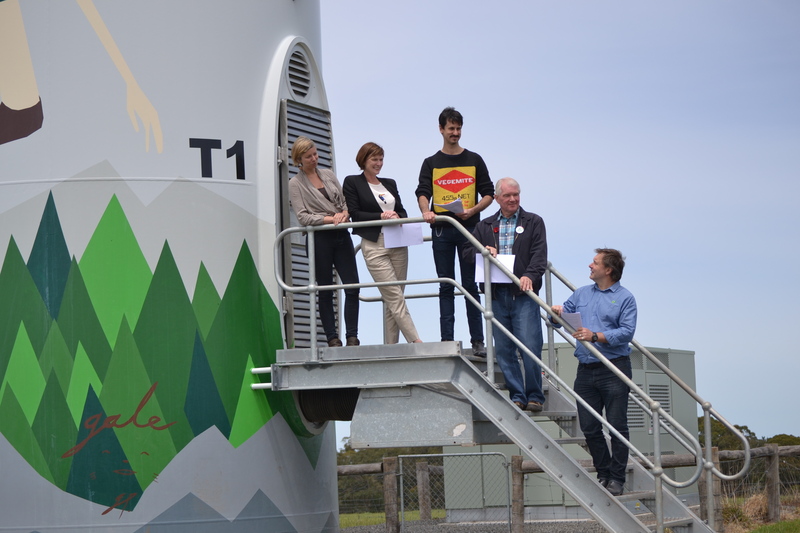 The report was launched at the Hepburn Wind, an operating community-owned wind farm in the west of the electorate. “The government introduced the world’s worst anti-wind farm laws without any community consultation. If the government won’t consult with Victorians, then communities will,” said Leigh Ewbank, Friends of the Earth’s renewable energy spokesperson. The community survey found a strong preference for renewable energy and an appetite to dump the government’s anti-wind farm laws. Anti-wind farm laws introduced in 2011 by the Bailleu government imposed a blanket ban on wind farms across the Macedon ranges. 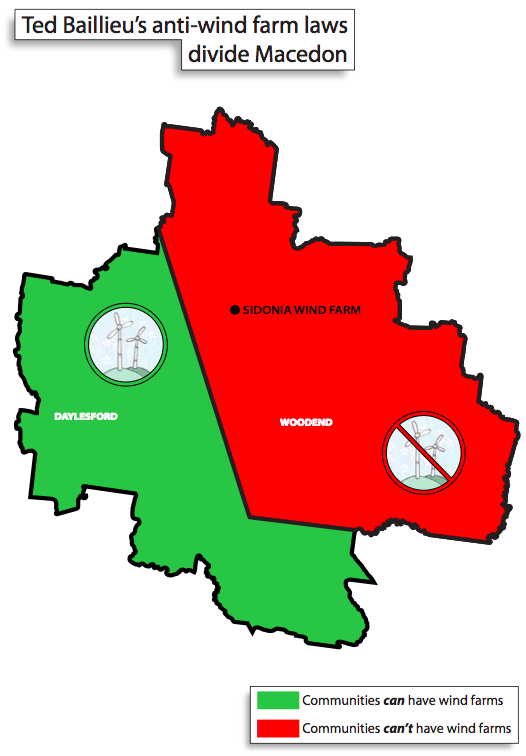 The arbitrary nature of blanket ban allows a community wind farm to operate in Daylesford, while projects of a similar scale are banned just 40 kilometers away in Woodend. Renewable energy and the anti-wind farms laws are a mainstream issue in the seat of Macedon. Liberal candidate for Macedon Donna Petrovich has previously expressed support for exempting community projects from the restrictions on wind farms, though there’s some scepticism in the community about her pledge. “Ms Petrovich has an opportunity to reiterate her support for community wind farms and reassure voters who want a good outcome for renewable energy,” added Leigh Ewbank. 97 per cent of respondents preferred renewable energy sources to fossil fuels. Solar was ranked as the most preferred energy source by 74 per cent of respondents. Wind farms was ranked placed first by 20 per cent and second by 58 per cent. 98 per cent of respondents supported more renewable energy in Victoria. The survey documented strong support for state government policies that encourage the renewable energy sector, such as a Victorian Renewable Energy Target. 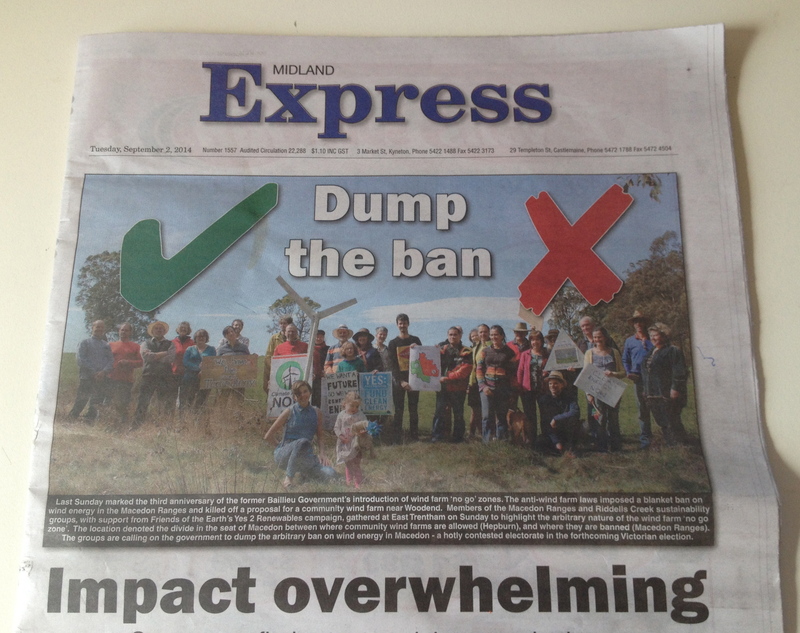 86 per cent of Macedon residents surveyed supported community wind farms similar to Hepburn wind. 84 per cent would support a similar-sized projects in their own region. 89 per cent believed that communities should be able to develop their own wind facilities. 80 per cent of those unaware of the anti-wind farm laws supported the their repeal. There is strong support for a 2km buffer from those that will actually be impacted by turbines.